In part one, we learned about the history of feeding dogs and dog food manufacturing. In this discussion, we will learn about specific canine nutrition needs due to their anatomy and physiology as a carnivore. Digestion and Anatomy of the Canine For comparison we will look at the three distinctive types of digestion anatomy in mammals. Herbivores have the longest digestive tracts, designed to ferment and process vegetation. Some have multiple stomachs for advanced fermentation to completely break down plant material for better digestion of these foods. These groups of animals have strong, flat molars to grind and break down grasses, and are built for grazing during most of their waking hours. Herbivores depend on vegetation for complete nutrition. They have the ability to break down the cellulose found in plant materials. Omnivores have medium length intestines and only one stomach, giving them the ability to consume some vegetation but also to digest animal proteins. Their detention includes flat molars and sharp teeth developed for some grinding and some tearing. This group may eat either plants or animal proteins, but most often eat both. They need both categories of food for complete nutrition. They have less ability to break down cellulose found in vegetables and grains. Carnivores have the shortest and simplest digestive tract for ease of digesting animal protein and fat. Dogs fall into this category. Carnivores have sharp, jagged, blade-shaped molars, designed for slicing, rather than flat grinding molars designed for grinding. Their jaws cannot go sideways, as in herbivores and omnivores that grind their food by chewing, but are hinged to open widely to swallow large chunks of meat whole. Carnivores have the ability to consume large quantities of food at one time and can rest between meals. This is called ‘gorging’ in the wild and has its place in hunting large game. Carnivores can consume large meals after a hunt and then rest until the next opportunity for a meal. Dogs need animal protein for a complete amino acid profile. They can live without any vegetation (carbohydrates) but can also do fine with eating small amounts. They do not have the ability to break down cellulose so plant materials are not digested well, if at all. For a better understanding of a dog’s mouth and how the teeth are designed, see Dental Anatomy of the Dog. Large amounts of vegetation, grains and fiber are difficult for dogs to digest. With their short and simple digestive tracts, they cannot ferment and digest these foods like herbivores, and to a smaller degree also omnivores. The result for dogs is a much larger stool volume from high grain, high fiber diets. ”The stomachs of dogs (and humans) make industrial strength hydrochloric acid that can dissolve iron. Dogs hold chewed food in their stomachs for 4 to 8 hours after ingestion. The low pH of the gastric juices provides a barrier to pathogens. Only a little food at a time is released in to the intestine, which it passes through quickly. This gives any bacteria that may live through the repeated acid baths little time to colonize and produce gastrointestinal distress. This information demonstrates how dogs can easily digest raw meat and bones and have the ability to destroy harmful bacteria. Nature is wise in her design and provides protection for these carnivores in consuming prey, drinking pond water and eating food stuff contaminated with bacteria. Problems such as salmonella, E Coli and other food borne pathogens are skillfully handled by the extended time in the strongly acidic environment of the stomach. Any surviving pathogens have little opportunity to propagate during their quick transit time though the intestines. Most dog food recipes are created upon the premise that the digestive system of the dog is similar to humans, with a correspondingly heavy emphasis on carbohydrates. This is partly because carbohydrates are cheaper to add to processed dog food and have a longer shelf life. This thinking is also seen in most home made recipes, which are simply following the same ratio of animal protein, carbohydrates and fat found in commercial dog foods. These recipes follow the processed manufacturers’ rules, rather than being designed to meet the real nutritional needs of the canine. It is hard not to follow their lead, with their claims of nutritional standards and balanced diets, but remember these diets are designed specifically for the manufacturers’ economic and packaging needs. These formulas are designed to fit the needs of the pet food companies more than for the nutritional needs of the dog. 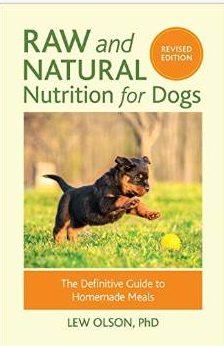 The National Research Council (NRC), which sets the standard for nutritional needs of dogs, does not list a carbohydrate requirement. They do include a long list of amino acids, and these are found complete in animal proteins. Fat is also listed, along with specific minerals. Meat, bones, organ meat, dairy and eggs can supply all of these requirements. Fat, protein and mineral needs will be addressed more fully in upcoming articles. Since the small intestine of the dog moves food more quickly than that of omnivores and herbivores, dogs are not designed to deal with foods that need fermenting or further breaking down. Foods that work well in this type of environment include animal protein and fat. They are broken down in the stomach and then passed through the small intestine to retrieve and utilize the amino acids from the protein and lipids from the fat. Additions of plant materials (grains, vegetables, fruit, and fiber) simply cause gas and large odoriferous stools. With the lack of ability to ferment or break these substances down completely, it would appear little nutritional use could be made of carbohydrates in the dog. Next month the discussion will be specifically on proteins, and more specifically on the differences of amino acids found in plant vs. animal proteins. An excellent website that discusses digestion and comparison of humans (omnivores), carnivores and ruminants (herbivores) is from Colorado State University. Contact Me If you would like to ask me any questions about my products, I would love to hear from you. Please check your return address when you send me email from my web site and try to write me again if you have not heard back from me.